To renew your United Kingdom passport or to apply for a visa, you must produce photos consistent with their very specific requirements. My Passport Photos is very familiar with what is needed for each type of passport or visa document and will get your photos right. Simply review the Quick Facts below and let My Passport Photos do all the work. If you are planning on traveling abroad, make sure you visit www.ivisa.com, so you know whether or not you need to obtain a visa. Rather than wasting a lot of time and money standing in line, iVisa can process most applications online quickly and affordably. Color: Only color is accepted. 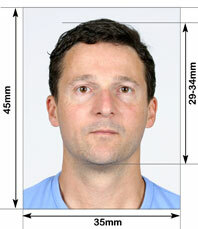 Head size and position: Head must be between 29mm and 34mm. Squared with upper shoulders in view. Recency: Taken in the last 30 days. Background: Cream or light grey colored. No designs. Glasses: Prescription only with eyes clearly visible. Headgear: Only headgear for religious or medical reasons are permitted. Beard: Either with or without is acceptable. Size is extremely important. The 45x35mm cannot be from a larger picture. No black and white photos are accepted. True colors only with no enhancements. Background cannot have any designs or be anything other than cream or light grey. If in a wheelchair, it must be covered with a sheet so it’s not visible in the photo. Smiling is not allowed. A neutral expression only. Mouth needs to be closed as well. Prescription glasses are allowed as long as eyes are clearly visible without glare or blockage from frames. No tinted lenses are allowed. If you wear any headgear for medical or religious purposes, it may not cover the facial features. Having your hair down is permitted so long as it doesn’t cover the face in any way. Beards are allowed if that’s how you normally look. Avoid growing one for the photo if you are normally clean shaven. There are no specifications for clothing attire. Use your own judgement. Each application needs to have 2 photos per person. This includes children. Each child needs their own photo. This is crucial for a speedy application. No toys, bottles or pacifiers can be visible in the photo. For infants under 12 months of age, a neutral expression is not mandatory. Eyes can be either open or closed. Infants can be held so long as the parent is not visible. This includes hands. If holding the infant is not a good option, try a car seat or laying them on their back with a plain colored sheet (cream or grey). Children 6 and under are not mandated to have a neutral expression. However, their face must still be clearly visible and squared to the camera. Eyes need to be forward and not looking away. Time and money are two commodities which drive each of us. So why not save on both? Depending on which method of picture taking you chose could make the difference of saved or extended time and higher or lower expenses. A less expensive direction is to go with an online service, such as MyPassportPhotos.com. For £4.79 you can receive two passport photos. If you need more, the price is cheaper. The photo can be taken at home or work and submitted. Once approved, you have two delivery methods: immediate download or sent to a store of your choice for pickups. If you are hesitant to have photos done online, you can opt for the old fashioned way. Prices range from £10-£15 per photo and it requires leaving work or home. If the place is busy, you may have to wait in lines and once the photo is taken, there’s no changing how it looks without extra cost. When deciding where and how to get these important photos, weigh the options and what best suits you and your lifestyle. If you have a family and plan to submit an application for everyone, the cost can rise. It’s up to you to decide how much of a rise you want. Receiving passport or visa photos have never been easier than this time in history. Waiting in lines or driving around town looking for a specific place is a method of the past. At MyPassportPhotos.com, we offer simple and convenient access to a less traditional way of taking and submitting photos. Choosing to do a passport photo online or visa photo online with us, you are guaranteed 100% government compliance and a worry free experience. Our staff checks and re checks to assure your photo is the best it can be. If rejected, we also offer as many retakes as you’d like until you are completely happy with the picture. We are cost effective and offer excellent customer service for those of you needing additional assistance. The process is easy and can be done at work or in the comfort of home. Give us a chance to complete your travel needs and get you to where you want to be.